Inside a dimly lit room, Rafael “Listo” Gaitan sits backward on a chair. His forearms rest on its top rail while his father, Rafael Sr.—or “Knuckles”—wraps his hands. 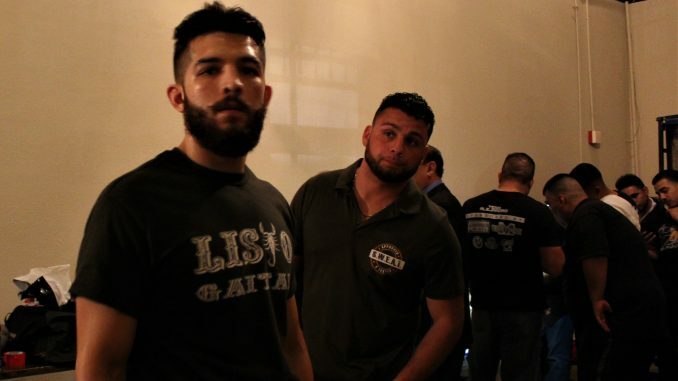 Listo’s other cornermen, each in matching shirts, look on. They joke and smile. Five other boxers and their cornermen stand around. Each has laid claim to an area in the room effectively serving as the red corner’s locker room. Inside, boxers are in various stages of their prefight routines that are determined by where their names appear on a hand-written list taped to the wall. It’s the order of fights. At 7:41 p.m., as the sun sets and the lower edges of the westward sky turn orange, a man in a black suit enters. As he opens the door, the slightly muddled sounds of music—a mixture of hip-hop and Mexican banda—becomes clear. “First fight, let’s go,” he says. The boxer who was hitting the mitts leaves, along with his people. They shout encouraging words to their man as they walk out. Once they’re gone, a relative peace comes with a little more room. Without the commotion, you see a boxer wearing red gloves, sitting in the corner. In silence, he stares at the floor, as if wondering how and why its uneven stains appeared. It’s the pointless questions that help distract the mind. Listo, sitting in his green trunks that bear the patch of a local drywall company that sponsors him, and t-shirt a shade darker, continues getting his hands wrapped. He and his team have been in this cramped room for close to an hour. His time to fight is almost here. He, and everyone inside this Old-West-themed nightclub in Irving, Texas, will fight on the Ides of March. 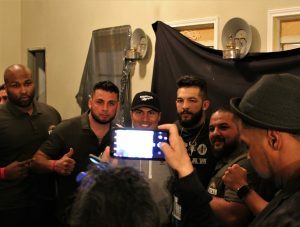 They will fight in front of a few hundred people, many of them friends and family of each boxer, on the night before one of this year’s most anticipated fights: Errol Spence Jr. versus Mikey Garcia. The distance between here and there—AT&T Stadium, host of that fight—is about a twenty-minute drive. But in terms of national importance, it’s a world apart. These are fights that happen every weekend across various parts of the country. Besides local boxing media, these fights are largely ignored and only become visible retroactively. A larger audience will go back to these fights only if one of these boxers makes it out of here and to a bigger stage. Only then will national media look back and see where it all began. These boxers fight largely in anonymity, with the hope of one day making it to the height of Spence and Garcia. That’s where the Gaitan family wants to reach. “We had him at a young age,” Knuckles says of Listo, his first-born son. “That’s what ended my boxing career.” He was seventeen when he found out he would be a father. Listo’s mother was fifteen. “I was happy because my life was a little different,” the father remembers, “You know, growing up in trouble and in the streets, it actually motivated me to become a man faster.” Still, coming from a boxing family, back in Durango, Mexico, and being around the sport his entire life, Knuckles hung a heavy bag in his garage that, on certain days, he would go out there and punch. Too young to train in a gym, Knuckles converted the family garage into a boxing gym. Out of that garage Knuckles trained Listo and other family members. Brothers and cousins—male and female—learned to fight there. And with the eldest son, the father noticed that everything he taught his namesake quickly learned. “Este cabrón es listo,” Knuckles thought. “This fucker is smart.” He called him Listo. The name stuck. As an amateur, Listo won a gold medal in the 2015 national championships. A few years later, he won Texas’s Golden Gloves tournament. Each of these victories, along with the many others, gave the Gaitans a sense of validation. “It’s like, man, we actually did something,” Knuckles remembers feeling. And now, as a twenty-year-old at the start of his professional boxing career, Listo continues fighting with goals of accomplishing something great. Boxing is a poor man’s sport. But that phrase also applies to what these boxers earn. At this level—the untelevised club shows—none of these boxers are making money. They get paid, but once you calculate the months of training and the costs associated with it, there’s no money. For every Spence and Garcia who eventually fight their way to earn millions, there are thousands of boxers who get paid as little as a few hundred dollars—perhaps less. Listo, like most boxers, works full-time. Each morning, before his job at a car dealership’s parts department, he wakes up hours before the sun rises. He runs. He finishes with enough time to shower and get ready for work, which starts at seven in the morning. He returns home around 5:20 p.m., rests for about thirty minutes before he and his father—also after a long day’s work as a diesel mechanic—drive from their North Texas home in Grand Prairie to a gym in Irving. They get there at around 6:20 p.m., sometimes later, depending on traffic. They train for a couple of hours, usually finishing by 8:30 p.m. They return home, shower, go to bed, and wake up to do the same the next day. So long as they are chasing their dream, they’ll do the same every day after that. And potentially, fighting on this card—promoted by Garcia Promotions—can help them and everyone here reach that goal. “My first fight was at a small ballroom show,” says Mikey Garcia who, along with others, helps run his family’s promotional company. Somewhere, someone must have at least a snippet of Garcia’s first fight in front of a few hundred people. 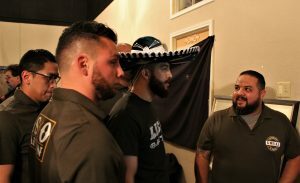 It’s those type of fights that Garcia Promotions, along with the help of others—Dallas’s Montoya Boxing Gym, in this case—organizes. The road to making it in boxing, however one defines that, is full of potholes. Even those who don’t follow boxing know the potential problems. They’re such a part of boxing they’ve become cliché. “You hear a lot of stories when you in this business,” Knuckles explains. Stories of managers and promoters putting their boxers in fights with little notice, acting as late-replacement opponents. Others take their young boxers, fifteen- and sixteen-year-olds, to Mexico for short money—even shorter once the promoters and manager’s cut comes—where they fight against grown men with much more experience. When that young boxer realizes his team doesn’t have his best interest in mind, he tries to fight under someone else, only to find out he has a contractual obligation. Back in the locker room, at 7:56 p.m., the first boxer who left returns. He and everyone around him are smiling. Unless you pull back the trash bags and dark linen covering the room’s doors and windows, you can’t see the ring from the room. But you assume he won. “Next,” a person on his team says, with a tone mimicking a butcher looking for the next person to serve. The boxer talks and, as he does, it becomes clear that he won. It’s always easier to critique your deficiencies after a win. Everyone around him looks happy. With his hands wrapped completely, Listo stands and moves around. Everyone in the room gets a little closer to each other. They give him space to break a sweat; it’s the courtesy every boxer gets. All stay out of his way as he punches through the air, imagining an opponent not yet there. A few minutes later, the door suddenly opens. Mikey Garcia walks in clapping, followed by about a dozen people. Many more would have entered the room if not for the door being forcibly closed to keep them out. Garcia talks with the boxers, takes pictures, and gives words of encouragement. Before Garcia exits, Listo and his team pose for a photo. Soon after Garcia leaves, Listo puts on his Mexican-flag-colored ten-ounce gloves. 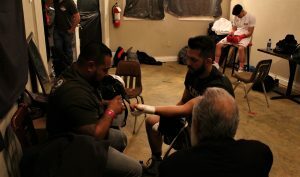 He hits the mitts with his co-trainer Hector Vazquez, called “El Diamante” during his fighting days. A rumor going around the boxing gym says that, as an amateur, Vazquez fought Errol Spence Jr. five times; it says the man now holding the mitts for Listo won each of those fights. After every flurry of punches, Vazquez gives soft-spoken, almost whispered advice. Listo nods. “How you feel?” Knuckles asks. “I feel good,” Listo responds. There’s a tension in that area of the room that wasn’t there before. There are no more jokes among them, saying the color of their shirts makes them look like a landscaping crew. They now wait. And it’s that wait that feels especially taxing. They know they’re ready. Listo has sparred against David Benavidez and learned from it. They’ve made their 175-pound weight limit. They’ve sold their t-shirts and their allotment of tickets. They’ve made arrangements with the teenage mariachi singer who will lead them singing into the ring. Listo has shaken hands, smiled for pictures and even held babies. And now, he’s ready to fight. “Listo!” a man wearing a suit and a lanyard, finally opens the door and yells into the room. 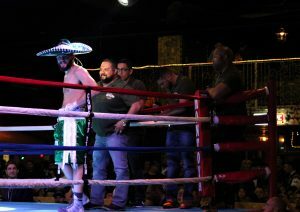 Wearing a mariachi hat, Listo and his team walk the back halls of the club. One last quiet moment before they enter the room, and then the ring, to a loud ovation and people chanting his name. He has lots of friends and family that buy tickets to his fights. “Nuestra gente”—our people—the Gaitans call them, feeling it disrespectful to call them fans. Inside the ring, in the corner, his father says a few words that only they know. The bell rings and less than six minutes of fight time later, the father walks behind the son with a proud smile on his face. They walk back to that temporary locker room where—for the first time all night—they feel a sense of relief. They go back to joking and smiling. It feels natural.